It was great. The place was beautiful and comfortable. Had the best times of my life. And the host Mr. Yiannis was very kind and helpful. He helped me a lot. 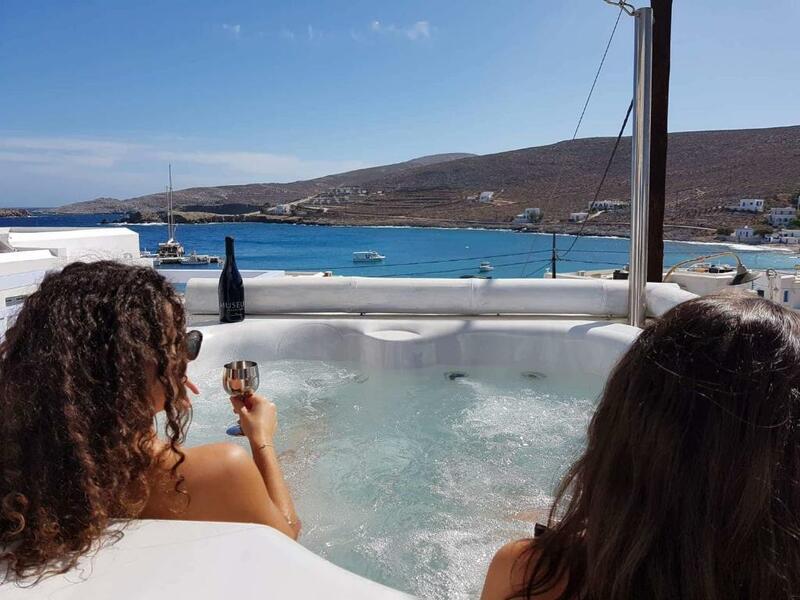 My wife and I spent 3 nights in Folegandros at AMO Suites. The suites are perfect and simple, with a nice view of the port and beach. They are clean and have nice touches throughout, like the overhead shower and the jacuzzi tub. The main reason to stay here though is the host. Yiannis could not have been more helpful during our stay. Not only does he give plenty of information and tips for the island, but he makes sure to help you with anything you need. We stayed towards the end of season so many buses and restaurants were closing for the year. Yiannis drove us where we needed to go on several occasions, to/from the port, and even to the next town Chora. 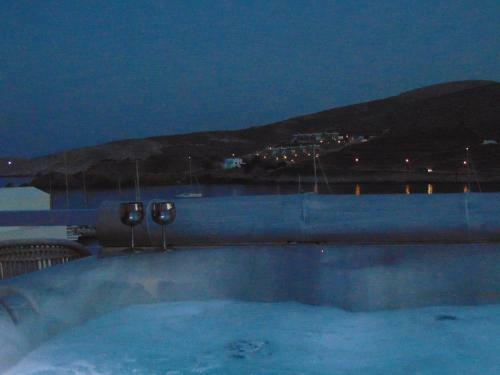 Highly recommend AMO Suites for anyone looking to stay in Folegandros. Gianni the owner was the most accomodating kind nice individual I ever met in Greece!!! Perfect stay : lovely view of the port from the apartment, cozy accommodation and facilites, very quiet and peaceful. Yiannis is very welcoming and nice, he makes everything easier for you. 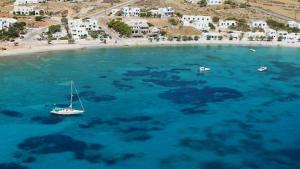 About 45 minutes by walk from Hora, a charming village in the center of Folegandros. Yannis came to pick us up at the harbour. We had asked for an early check-in but we had to wait a little bit so he drove us around the island to show us around. We really liked the room, which had a nice view over the harbour. Yannis told us the bus wasn't running that often because of the low season so he offered to drive us anywhere if we wanted to go somewhere. That was really nice! The room was very clean as well and the spa was nice too. We really enjoyed our stay on Folegandros even though a lot of the shops and restaurants were closed because of low season. Yannis made our stay even better! Stylish room with a lovely shower room. 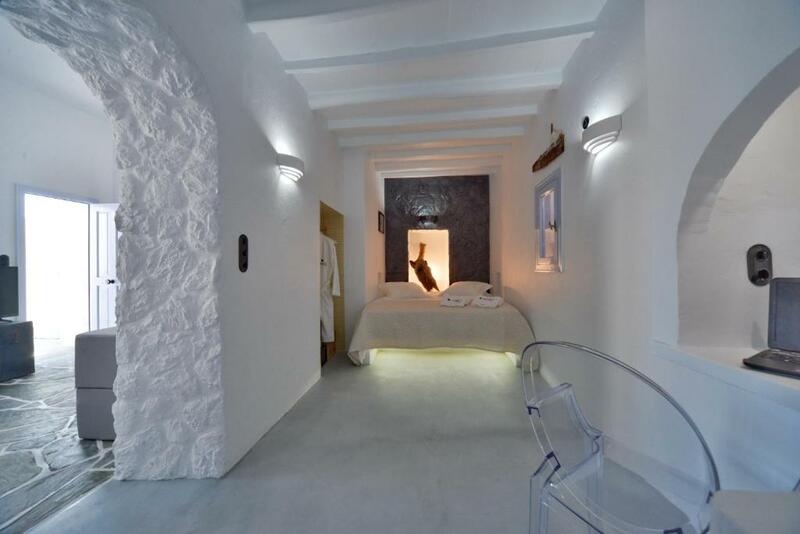 The accommodation was spotlessly clean, with beautiful soft white towels and lovely bed linen. The bed was so comfortable. A great location close to the ferry with a bus stop by the apartment. Car hire outlet just across the road. Local bars and tavernas, this had everything you could want. Jannis (apologies for the spelling) the owner made our stay amazing. An excellent host. Giannis was an excellent host and AMO Suites was a wonderful place to stay for our holiday: very clean, the bed was comfortable, well equipped (first place, I stayed that had beach mats and umbrella). Walking distance to 2 beautiful beaches. Also, Giannis gave us a quick tour to familiarize us with island. He really wants his guest to have a great time on the island! We are looking forward to going back to AMO Suites, again! Lock in a great price for AMO Suites – rated 9.7 by recent guests! AMO Suites is located in Karavostasis. The accommodations features a hot tub. Free WiFi is offered . All units feature a flat-screen TV. Some units have a seating area and/or balcony. There is a private bathroom with a bath or shower and bathrobes in every unit. Towels and bed linen are featured. All the deluxe suites also feature a hot tub in the terrace. Guests can enjoy a drink at the on-site bar. The property also offers grocery delivery. This property also has one of the top-rated locations in Karavostasi! Guests are happier about it compared to other properties in the area. This property is also rated for the best value in Karavostasi! Guests are getting more for their money when compared to other properties in this city. When would you like to stay at AMO Suites? This deluxe suite with sea view includes a flat-screen TV, a hot tab in the terrace, a bathroom with a shower and a seating area. This studio apartment with sea view includes a flat-screen TV, a bathroom with a shower and a seating area. Guests are benefited form a hot tab in the terrace. AMOSuites is a complex of brand new luxury suites . Each suite is uniquely designed to make you feel perfect and to enjoy your stay. Fitted with Cycladic-modern style architectural elements, all units at AMO Suites offer living areas, fully equipped kitchens and private infinity hydromassage outdoor . Comfort is provided by the modern amenities in each suite: electronic safe-boxes, fully air-conditioning, free Wi-Fi access in all areas, satellite TV, outdoor tables. Its unique location makes it a perfect retreat for couples,small families, seeking tranquility, privacy and luxury. The unique and fanciful decoration is completed by the panoramic, bracing Sea views. With more than 20 years experience in the tourism industry, we continuously strive to improve the quality of our services, aiming for excellency, so our guests can enjoy the most unforgettable stay with us. With more than 20 years experience in the tourism industry, we continuously strive to improve the quality of our services, aiming for excellency, so our guests can enjoy the most unforgettable stay with us. House Rules AMO Suites takes special requests – add in the next step! AMO Suites accepts these cards and reserves the right to temporarily hold an amount prior to arrival. Please inform AMO Suites of your expected arrival time in advance. You can use the Special Requests box when booking, or contact the property directly using the contact details in your confirmation. Nothing it was just perfect. Yiannis was a very gracious host. He picked us up and dropped us off at the port, gave us a quick tour of the island, and a nice bottle of wine! Picked up from the port, which is always a nice touch. The bed very comfy and shower powerful. Was able to arrange an earl;y check in , which was helpful. The property is at the port, 3km from Chora and you need to travel to the best ( less crowded)beaches by car/bus/scooter/quad etc. Giannis and his wife were the kindest hosts. Giannis met us at the port and gave us a tour of the island, while the room was being prepared. The room was beautiful with fun design touches that made the space feel special. We went to all the restaurants and beaches recommended by Giannis and were not disappointed. Just a note for those excited about the hot tub, it seems for many of the island the hot tubs are not hot jacuzzis but small pools, which was fine for us on hot days! The bathroom design makes it difficult not to splash water everywhere while showering. The hot tub located on the terrace couldn't be used because the water was too cold and couldn'nt be heated. 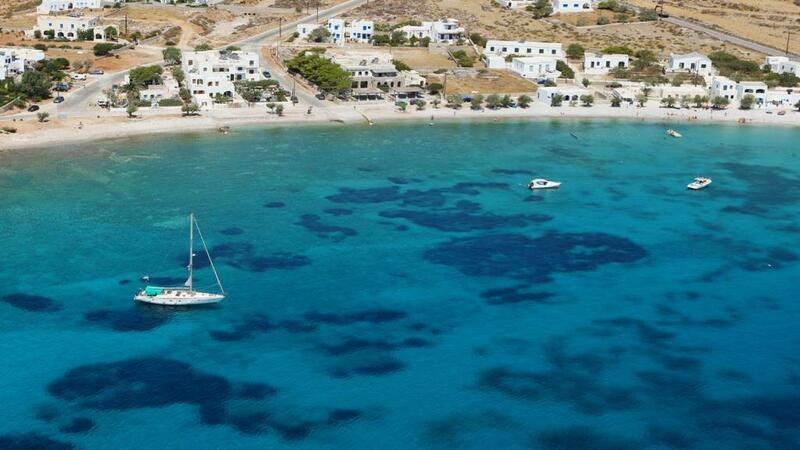 The room was ideally located in the small port of Karavostassis (where the boats arrive). The room was spacious and clean, and benefitted from a large terrace with a nice view. Checking in and out was very easy, as the owner lives right downstairs. Folegandros is an amazing island, very small and quiet, with breathtaking views, lots of hiking possibilities, as well as beautiful beaches (some are hard to reach, wich makes them even more precious). I would recommand staying there! The village of Chora is more animated, with many restaurants, bars, shops, and the most amazing sunset from the church. The room was beautiful with a great view! The host was helpful and showed us by arrival at the island all the great spots of the island.